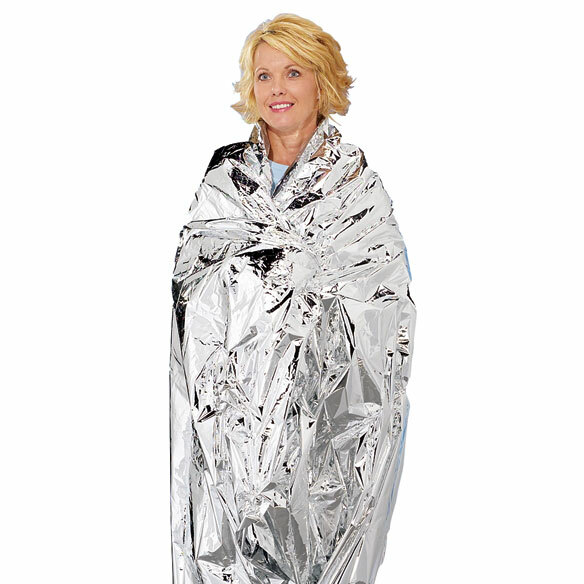 Emergency survival blanket folds to fit glovebox, emergency kit or purse. 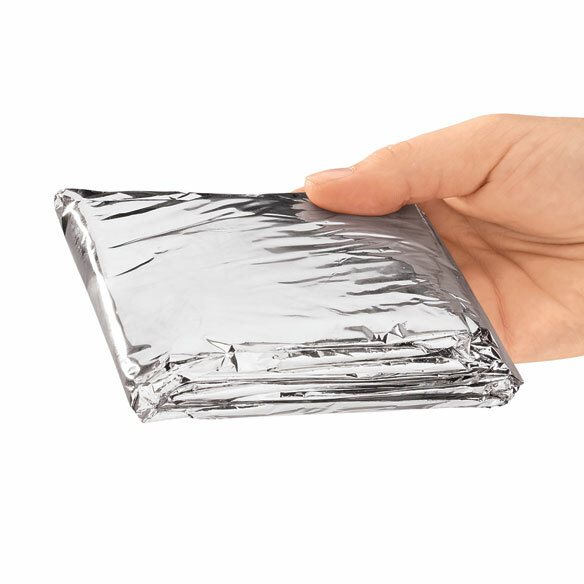 This emergency foil blanket prepares you for unexpected cold or emergency shock situations. A must for any auto, the twin-size emergency blanket is crafted of lightweight aluminized fabric which reflects up to 80% of body heat. 84"L x 56"W.
We bought this last year and they were great! We pack them in emergency bags for the homeless along with a bottle of water, granola bar, hat, gloves and $5.00. They are perfect for this! This blanket is a must for a Chicago winter driving. Is a gift to a friend whose car just lost its heater! Have given to grandchildren who work in cold weather states in case they get stuck in the snow during winter. They were pleased to receive them. I purchased these to put in all of our vehicles as a safety measure and they shredded it in my hands as I tried to open... them very disappointed!! I have a family of paramedics and EMTs. Recently I needed the help of an EMT. He told me about these Emergency Survival Blankets and said everyone should have one. Especially in this State of Ohio with our cold, blustery weather. Since I am a widow and drive alone most of the time, he said I should have one in the glove compartment at all times. I've never had to use it but am giving every member of my family one in their Christmas stocking. If your car won't run, the heater can't work and this Survival Blanket can keep you warm. One of these blankets was in my first aid kid for the car. I used it to protect my pet when I had to take the bus with the pet carrier. Couldn't use a regular "home" blanket due to weight issue and bulk. I thought that my first aid kid isn't complete without it. It ripped due to rough handling by a vet assistant. These emergency blankets are perfect any type of emergency. I bought them for my emergency bag. You will never know when this will be needed. In your home or in your car. It never hurts to be ready. Especially with our crazy weather and losing power. I gave one of these to each of our four daughters to keep in the trunk of their cars - if you get stuck or stalled during a Chicago blizzard at least you won't freeze or you can warp the kids up! Every auto should have one! Easy to store. A must if ever stuck in your auto during cold weather. Could be a life saver. Having known several people who have been stuck overnight after not getting back from a day hike, I want this blanket with me at all times. It has many uses: warmth, teepee in rain or snow, reflective to alert your location, sit pad, pillow if really desparate, and probably many more I have not thought of. It is like duct tape; very handy in many situations. It does not take up much space and is extremely lightweight but holds up well. can be used between mattress and sheet for extra winter warmth, cut to size to cover feet in shoes/boots/mittens and a must have for vehicle in case of breakdown. Homeless people could use them. The crinkle noise you hear you get used to after a while. Should keep 2-3 in each vehicle and a sandwich baggie to hold them if you need to fold them back up. I run in some cold weather competitive races. At the end clad only in Tank Top, Shorts and shoes I wrap this blanket around myself to keep warm and not dehydrate. I also bought this for my car for a trip up north in cold weather just in case I needed it. gave one out to all 3 kids to keep in there car. keep in glove compartment for emergencys. it is fabulous because it is so small, yet can do a big job. had some years ago and glad I foun d these. It reflects body heat and prevents heat loss. I used it on the bed, but it got so warm I had to cut it in half and only use it under my body, not legs. Didn't have to keep a room heater on at night. It does sound like sleeping on a potato chip bag for a few nights, but it is sooo warm. As an EMT, God send for calls, a great blanket for shock. Needed for First Responder and LEO. Am giving this as a stocking stuffer for Xmas. We're not in the winter yet, I'm hoping this works, trust me.. Nobody wants to break down. I ordered 2, always keep a blanket in car(s) just in case. My heater went out in my van so the blanket came in handy to keep me warm until I got it fixed. My friends are very cold nature so they keep themselves wrapped in it. In a quiet place it makes noise when moving. haven't had the chance to use this and hope never to need to. Nice to know that if I do need it it will be there. Am making emergency backpacks for me and my family. This is a perfect addition to it and uses very little space. I have it as part of my hurricane preparation kit. It's good to know that I have something I can use to keep me warm if needed. To be honest, I hope to never find it necessary to use this "blanket" as that would indicate a major problem. But at least I am prepared now! Readily available whenever I need it. SEVERAL OTHER WAYS TO USE! This product should be listed for many other uses under its title and description! This product is absolutely wonderful for saving money in the winter! I use it underneath my pets blankets & beds to keep them warm & they love. I am a very frugal & moneysaving person so I don't like running the heat when I'm not home & i turn down the thermostat at night but I feel bad because I don't want my pets to get cold so cutting this blanket down according to the size of the pet bed I place it under my cats pet beds, blankets & even her pet window sill stand/bed. It's a lot safer & more cost effective than leaving a heating blanket or heating pad on. These are also great cut down to size to put in, on or cover unused windows or doors to reflect the heat inside. They are not the prettiest but they certainly are effective and worth the savings you get in keeping a room or hall warm & heated. this is the same exact thing they put in insulated curtains to reflect the heat inside. The flimsiness and sound of crackling it makes during installation is it's only downfall but it's just the nature of the material itself; and there's really no way for the product to be manufactured based on the chemical elements. The crackling really doesn't occur after installation if u secure it properly wherever u put it. I'm really not going to use it for emergency blanket at all I just purchased one and then I cut it down for the uses I just explained. Very pleased & great savings & energy product. This is very small and thin, hope it holds true to the advertisement if I ever need it. Bought for my daughters & granddaughters. Did not like item at all. There should be some kind of lining underneath blanket to prevent from tearing. I have purchased for years and its been ok. This year flimsy, stuck together and ripped to shreds. To keep in cars for emergencies. IT IS FRIGID COLD HERE IN MICHIGAN AND JUST IN CASE I GET STRANDED, I'D LIKE TO HAVE SOMETHING TO KEEP ME WARM. "Always be prepared" is my motto. I should have purchased it years ago; I live in Chicago. Never know when you or someone in trouble might need some added warmth and kindness. I chose this blanket to keep in my automobile for emergencies. It should be warmer than the 48 year old blanket I keep in my car with the other cold weather supplies. Because it is useful. Besides, it makes a lovely and affordable Christmas present. Thank you. I live where winters can be below freezing for days - I keep it in the car in case I have an emergency while I am driving between my home and my daughters home. Anything can happen at any time...why not be prepared? Live in Maine and wanted to add item to winter emergency items in car. For my grandchildren to carry in their car for emergencies. On sale and to put in vehicles. I buy these for emergency's like, electricity is off. I keep one in my car in case of an accident. Can be useful in emergencies. I bought this as a stocking stuffer for my adult daughter to keep in her car in case of emergency. This blanket is a good and inexpensive choice for emergencies or general use. To give to the homeless. Helpful in case of emergency while on the road. Just in case we have a power outage in cold weather and there was no other way to keep warm. For my daughter in case of emergency. It's good to keep them in your car you never know when you may need one. emergency only. Hope never have to use.